Father and son team Robert and David de Hilster are currently writing a book together. 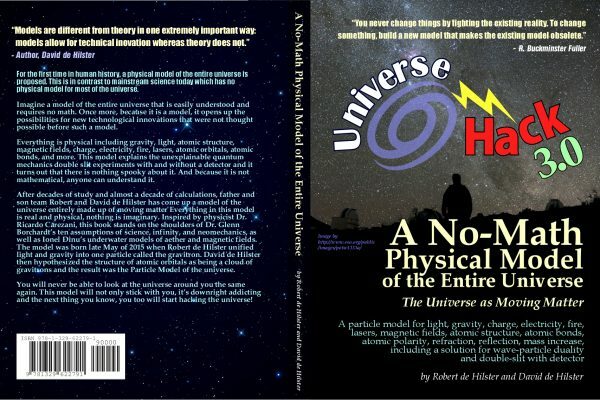 The title is “Universe Hack 3.0 – A No-Match Physical Model of the Entire Universe“. Imagine a model of the entire universe that is easily understood and requires no math. Once more, because it is a model, it opens up the possibilities for new technological innovations that were not thought possible before such a model. Everything is physical including gravity, light, atomic structure, magnetic fields, charge, electricity, fire, lasers, atomic orbitals, atomic bonds, and more. This model explains the unexplainable quantum mechanics double slit experiments with and without a detector and it turns out that there is nothing spooky about it. And because it is not mathematical, anyone can understand it. After decades of study and almost a decade of calculations, father and son team Bob and David de Hilster has come up a model of the universe entirely made up of moving mass. Everything in this model is real and physical, nothing is imaginary. Inspired by physicist Dr. Ricardo Carezani, this book stands on the shoulders of Dr. Glenn Borchardt’s ten assumptions of science, infinity, and neomechanics, as well as Ionel Dinu’s underwater models of aether and magnetic fields. The model was born late May of 2015 when Robert de Hilster unified light and gravity into one particle called the gravitron or G1 particles. David de Hilster then hypothesized the structure of atomic orbitals as being a cloud of G1 particles and the result was the Particle Model of the universe. You will never be able to look at the universe around you the same again. This model will not only stick with you, it’s downright addicting and the next thing you know, you too will start hacking the universe!